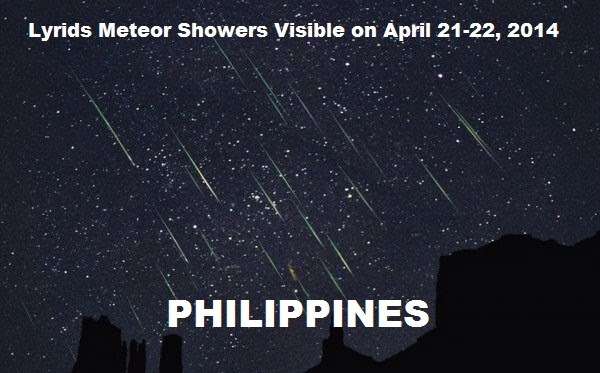 April 21, 2014; Monday, A dozen of meteors per hour tonight until tomorrow can be seen in the Philippine sky according to the Philippine Atmospheric, Geophysical and Astronomical Services Administration (PAGASA). The stargazers are now excited to see a very rare occurrence that is according again to the said agency will take place on April 21 – April 22. If you are going to watch meteor shower tonight, you will find yourself witnessing Lyrids. Usually Lyrids occur from April 16 to April 26. And in the Philippines it will be April 21 – April 22 on which the start is today. The explanation for this is that the said meteor shower is located in the constellation Lyra and their peak is on April 22 of every year. According to PAG-ASA, this has been observed for as long as 2,600 years already and the Chinese recorded this as “stars fell like rain” at 687 B.C. wherein there was a meteor shower that time and according to the records, Lyrids during early times are generally weak. NASA explained that Lyrids are debris that came from Comet C/1861 G1 Thatcher. It was discovered in 1961 by A.E. Thatcher. This comet comes periodically. The Filipinos who are aware of this happening are preparing their gadgets already like telescope, camera, etc. in order to capture a photo or video of the said meteor showers. And since this is tonight, many are wishing that it will not rain in order to see clearly the meteors falling very quick. If ever you will get out of your house tonight and see meteor showers, care to go back to this article and share your experience seeing them. Your eyes will surely be filled with wonders as you stare at those Lyrids coming to the earth. There is surely a celebration tonight by stargazers. Since you are informed about this thing, the best thing to do now is share this to others.